Egyptian President Abdel Fattah el-Sisi said on Thursday that he is prepared to personally join the battle against Islamic State (ISIS) militants in the Sinai Peninsula. Before assuming the presidency following a 2013 coup, Sisi held the rank of general and was head of Egypt’s armed forces. The Associated Press points out that Sisi is up for re-election in two weeks, implying this is one of the motivating factors behind his tough anti-ISIS rhetoric, although the AP also notes he is effectively running unopposed. The lack of meaningful opposition in the Egyptian presidential race has been a topic of much international concern. Despite positive pronouncements by the Sisi regime, Egypt’s campaign against ISIS affiliated fighters in the North Sinai is not going well. Part of the problem is the regime’s blunt force approach—indiscriminate bombing as well as the razing of entire villages and some extrajudicial killings—is ill suited to the requirements of effective counterterrorism operations. After a long period of ignoring advice from American and European experts, an increasingly stymied military command has finally begun to participate in joint training exercises with U.S. forces. It is hoped the Egyptians are open to learning from the painful lessons the U.S. took away from Iraq and Afghanistan. Early indications are not encouraging. An anecdote making the rounds in Washington involves a training exercise, held in a mock village, wherein an Egyptian soldier came under attack, after returning fire, the soldier’s next course of action was to call in air strikes. When his U.S. counterpart questioned his call, pointing out many villagers would likely die in such a strike, the soldier merely shrugged his shoulders and said the villagers were probably all guilty anyway. Apocryphal or not, this in microcosm captures the futility of Egypt’s outdated attitudes and doctrine in the face of complex challenges posed by terrorists in North Sinai. 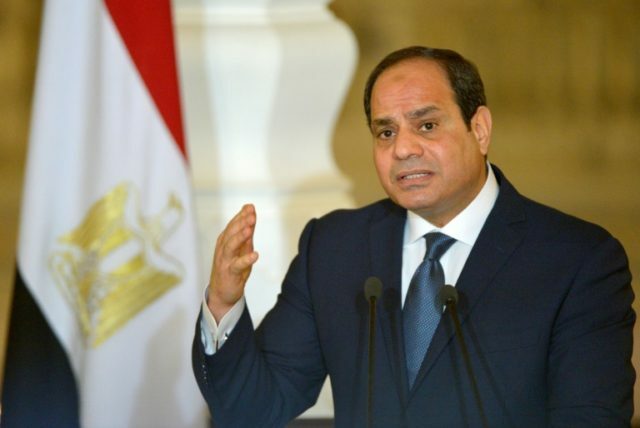 The current Egyptian offensive against the “Wilayat Sinai” franchise of ISIS has been portrayed as successful by the government, with 71 militants killed and 1,800 arrested, but Sisi’s latest remarks suggest he remains deeply concerned with the militant threat. The operation was launched after the horrific slaughter at a Sufi mosque in the Sinai that killed over 300 people, making it the deadliest terror attack in Egyptian history. ISIS flourished in the Sinai thanks to local tribal resentments and is able to regenerate some of its strength as Sisi’s heavy-handed tactics alienate Sinai residents further. Also, as the Hill points out, the lingering schism between mainland Egyptians and Bedouin tribes makes it hard for the government to develop good intelligence and law-enforcement assets in the region. Sisi ordered the Egyptian army to wrap up “Operation Sinai 2018” by the end of February and completely purge ISIS from the Sinai Peninsula, but the army said that goal was unrealistic and asked for more time, citing the rugged terrain and support ISIS enjoys from local tribes. The collapse of the Egyptian government during the 2011 “Arab Spring” uprising played a role as well, disabling agencies that had been keeping a lid on Sinai violence and flooding the region with escaped criminals. Some analysts portray the Sinai as being in a state of low-level revolt since 2011, as residents vented years of anger against ousted strongman Hosni Mubarak and became vulnerable to Islamic State recruitment. The Egyptian government arguably sees the Sinai as something between a terrorist crisis and an insurrection, which would explain why the military is not too concerned about inflicting collateral damage. It does not help that Sisi is working from a military background and using warfighting forces for counter-terrorism purposes. Outside observers generally believe that pure military force will not be sufficient, advising the Egyptian government to work on developing better ties with Sinai tribal leaders and win their help against the militants. There has been more cooperation lately as ISIS turned against the tribes and murdered some of their members. ISIS responded to Sisi’s Operation Sinai 2018 with its own call for increased terrorist attacks against government installations, election centers, tourists, and Christians. The terrorist group promised more violence and chaos during the March elections, deeming democracy itself to be blasphemy against Allah. “It is clear to all that the elections are the greatest [form of] polytheism. They have brought upon you nothing but disasters, oppression and subjugation, and punishment from Allah. If the blood that has been sacrificed for their sake had been sacrificed for Allah’s sake, the situation would have been different,” said one ISIS militant quoted by MEMRI. He went on to advise ruining “their day of polytheism” by targeting the elections, possibly in the hope that depressed turnout from fearful citizens will embarrass Sisi. ISIS publications are pushing the idea that “soldiers of the Caliphate in the Sinai province” have humiliated the Egyptian military and promise to undermine any Sisi claims of success against them by launching a fresh wave of attacks. The irony will most likely be lost on ISIS, but their terror campaign in the Sinai has clearly pushed Egypt closer to Israel. One of the reasons mainland Egyptians treated the Sinai Bedouins badly is that they accused the Bedouins of being Israeli collaborators in the Six Day War.